Recently, you may have heard that scientists have discovered small plastic particles floating in the open ocean and in the Great Lakes. The presence of these tiny plastic pieces is a cause of concern on its own, but did you know that plastic can also interact with other forms of marine pollution? Researchers from San Diego State University and Oregon State University deployed small pellets made from different types of plastics in San Diego Bay to simulate plastic debris in the marine environment. They analyzed changes in concentrations of toxic pollutants called PAHs in the plastic over time to investigate whether plastics leached or accumulated these contaminants. Their findings suggest that polystyrene, used in hard plastic packaging and in products like Styrofoam, may pose a more serious threat to marine environments than other plastics like polyethylene or polypropylene. This study could help researchers better understand health risks posed to marine organisms like fish that ingest small pieces of plastic in the surface ocean. Figure 1: Examples of some common compounds classified as PAHs. 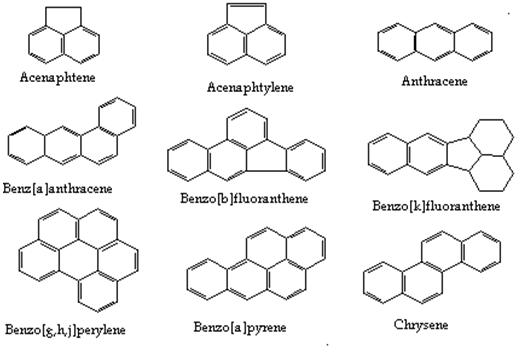 Polycyclic aromatic hydrocarbons (PAHs) are a major cancer-causing component of air pollution. They originate from incomplete combustion processes, and thus are emitted almost any time something organic is burned. Major sources of PAHs to the environment are vehicle exhaust, coal-burning power plants, and biomass burning, which includes wood burning, crop burning, and forest fires. PAHs are also a major component of petroleum and are responsible for many of the long-lasting health risks associated with oil spills. These organic pollutants are made up of different numbers of 6-carbon rings (Figure 1) and are ubiquitous, meaning they are found everywhere in air, water, sediments, and organisms. There are many different compounds classified as PAHs, and some have different sources, or behave differently in the environment, than others. PAHs have been studied for decades due to their cancer-causing properties and their tendency to persist and accumulate in living things. PAHs can accumulate in living things because they are hydrophobic, which literally translates into “scared of water.” Hydrophobic compounds are more likely to dissolve in materials like fatty tissue, particulate matter, or plastic than in water, so they tend to move out of water and into these substances. It follows that, at equilibrium, PAHs are found at higher concentrations in these materials than in water. Scientists are concerned about persistent, hydrophobic toxins because they accumulate very effectively in marine sediments and aquatic biota. Recently, researchers have turned their attention to another threat to marine life: plastic debris. Small pieces of plastic are being discovered floating in surface waters and sinking into marine sediments. Sources of the plastics include micro-beads in soaps and body washes, packing materials, and the degradation, or weathering, of larger plastic products. While scientists are aware that larger pieces of plastic debris are problematic for birds, fish, and marine mammals, the potential health risks of small plastic pieces are not well understood. Plastic particles have been found in the gut contents of fish, suggesting that they are easily ingested, possibly after being mistaken for food. In this study, researchers were especially focused on polystyrene, a common plastic that has been found previously in the guts of fish. Polystyrene is a hard, brittle plastic often used to make packaging. Polystyrene foam, or Styrofoam, is also a very common product used to make cups, packing peanuts, and other products. Polystyrene has hormone-disrupting and cancer-causing properties, even without considering associations with hydrophobic contaminants that could be attracted to the material. These properties could be enhanced further if the material absorbs PAHs from seawater. In this study, the researchers deployed pellets made of hard polystyrene, as opposed to foamed polystyrene. To understand all of the ways small plastic particles could impact the marine environment, researchers must investigate the relationship between plastic debris and ubiquitous hydrophobic contaminants that are attracted to plastic, such as PAHs. While researchers know that PAHs are attracted to plastic, they are unsure whether plastics in the ocean enter the water pre-loaded with these pollutants, leaching them into the water, or whether they primarily absorb PAHs from the water column. Researchers placed newly manufactured plastic pellets in mesh bags and deployed them at two locations in San Diego Bay: one in the center and the other near the mouth of the bay. They also analyzed new pellets that had not been deployed to determine whether they originally contained PAHs. Several types of plastic were investigated to find out whether certain plastics absorb or leach PAHs to a greater degree than others. Researchers found it particularly difficult to measure PAHs in polystyrene, as compared to other plastics, by traditional techniques such as gas chromatography/mass spectrometry (GC/MS).The compounds that make up the plastic material interfere, causing large peaks that make it impossible to measure some of the PAHs accurately. 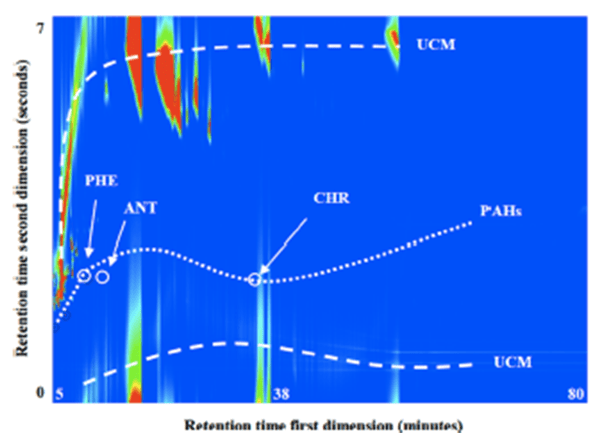 For this reason, they used a more sophisticated technique to detect PAHs in polystyrene called two-dimensional gas chromatography to sufficiently separate all the PAHs from the interfering polystyrene matrix (Figure 2). Figure 2: To analyze polystyrene pellets, researchers used an advanced analytical technique to separate components of the polystyrene from PAHs that were absorbed by the polystyrene. Each compound is represented by a mark on the plot. PHE, ANT, and CHR are abbreviations for three PAHs – phenanthrene, anthracene, and chrysene – which were impossible for researchers to see using their typical analysis techniques. 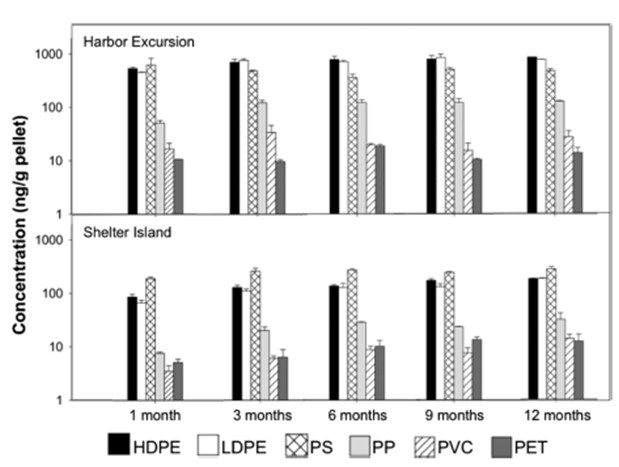 Figure 3: Concentrations of PAHs in different types of plastics exposed to the water column over time (HDPE – high density polyethylene; LDPE – low density polyethylene; PS – polystyrene; PP – polypropylene; PVC – polyvinyl chloride; PET – polyethylene terephthalate) near the mouth of the bay (Shelter Island) and at the center of the bay (Harbor Excursion). Concentrations were highest in polyethylene and polystyrene, and were higher at the central bay location than at the mouth of the bay. Concentrations of most PAHs increased over time in plastic pellets, suggesting that plastic acts as a sink for PAHs in San Diego Bay: Dissolved PAHs are being removed from the water column and accumulating in plastic. Concentrations of PAHs measured in plastic were generally higher in the central bay (closer to the land) than at the mouth of the bay. Some PAHs, especially those found at high levels in petroleum products, were detected in plastic before deployment. Detection of PAHs in new plastic pellets was expected because PAHs can easily form as byproducts of plastic manufacturing. Before deployment, PAHs in polystyrene were found at 8-200 times higher concentrations than in polyethylene, polypropylene, polyvinyl chloride, or polyethylene terephthalate. After deployment, polyethylene and polystyrene had accumulated the highest concentrations of PAHs, suggesting that PAHs in water were absorbed most effectively by these materials. Final concentrations of PAHs in polystyrene and polyethylene were similar, suggesting that PAHs are similarly attracted to these two plastics. However, researchers found that absorption to polystyrene happens more quickly than absorption to other types of plastics. When plastic pellets are exposed to water, hydrophobic contaminants will accumulate in the plastic until it is saturated, or at equilibrium with surrounding water. After this, the concentration of PAHs in the plastic will remain relatively steady. Concentrations of PAHs in polystyrene changed little after the first month of deployment, suggesting that PAHs had accumulated quickly and reached the saturation point where no more could be absorbed. Concentrations in polyethylene and polypropylene did not reach saturation after a month and continued to increase for 6 months. This study expands our understanding of risks posed by plastic particles, and particularly polystyrene, in marine habitats. Not only is polystyrene hazardous on its own due to its toxic properties, it can also rapidly absorb toxic compounds such as PAHs from the surrounding environment. The ability of polystyrene to accumulate high concentrations of hydrophobic toxins in a relatively short amount of time drew attention from researchers because it suggests that polystyrene may be a higher risk to marine biota than other plastics. In addition to PAHs, there are a number of other hydrophobic toxins present in the water that could be accumulating in plastic, such as dioxins, polychlorinated biphenyls (PCBs), and flame retardants. Little is known about the degree to which these compounds accumulate in plastic debris and what this might mean for marine organisms. Continued investigations to find out how plastics interact with the diverse mixture of toxic contaminants present in marine environments are crucial if we want to understand and predict effects of marine plastic debris on the health of marine ecosystems.